Chopin students began preparations this week for this exciting opportunity to perform onstage at Orchestra Hall. Civic Orchestra of Chicago members are spending a four-day residency on-site at Chopin as part of the Chicago Symphony Orchestra’s Citizen Musician initiative. 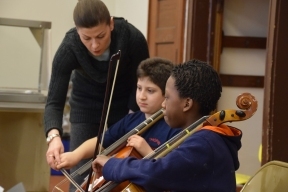 All of this week, Civic Orchestra of Chicago musicians are going into the school to work directly with Chopin’s students through an intensive series of rehearsals, one-on-one mentoring sessions and workshops. The culmination of the residency will be a free concert this Thursday, January 15 at 5 p.m. in Chopin’s auditorium, when Civic Orchestra members, Merit educators and Chopin’s youth orchestra will showcase the results of their training together. Parents, students and the neighboring community are invited to attend. This event is free and tickets are required. Limit 8 per household. To reserve tickets, please call (312) 294-3000. To learn more, visit meritmusic.org or call 312.786.9428.